Description: Mahogany, Sitka spruce, ebony, tortoise binding, animal protein glue, modified V neck, 1-3/4" nut width, 24-7/16" scale length, Trad. 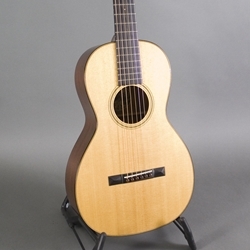 series bracing, Waverly tuners, includes Collings made case. Serial Number 28171.